Who was the earliest and fastest British finisher of PBP? And in what year and what time? Mick Potts was the first fast Brit at PBP but that was within living memory (1991). Then Ritchie Tout, both unsupported riders. Gethin Butler and John Barkman are the fastest recent AUKs. The closest AUK analogue to Charly Miller is the Aussie, Opperman. He was the only non-European to ever win PBP, in 1931. His employer went bankrupt while he was riding PBP, so no winner's bonus. Oppy was AUK's Patron until his death. http://www.randonneurs.bc.ca/pbp/time_results/2015.html will let you hunt for finish times. John Barkman's from the USA, although an AUK member. So Gethin Butler is the fastest Brit. There's an interesting connection with Sir Hubert Opperman. Both Gethin and Sir Hubert have held the LEJOG record, and rode PBP in very similar times, although Butler was on his own largely, having missed the first start in 2003. I've been doing some research around the LEJOG, and a significant figure in the early days was G.P. Mills, who won Bordeaux-Paris in 1891, and the paced LEJOG record in the same year. Mills worked as chief engineer for Humber who made bicycles, motorbikes and cars. 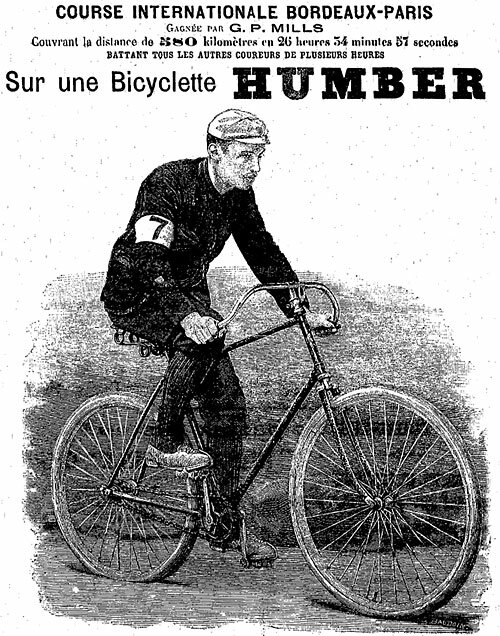 One of the pacers for Mills on Bordeaux-Paris was Charles Terront, who won the first PBP on a Humber bicycle. I seem to recall Mick got a time penalty for using support outside the permitted areas (Joy met him with the camper-van). I don't know, that was before my time. My first audax was 1992 and didn't get to PBP until 1999. Mick is noted in AUK's history as the first back that year with a saddlebag and perhaps I've misinterpreted that. Ritchie was definitely unsupported. It's anecdotal, but back in around 1980, I remember it was talked about that Eric Millington was the first British rider to finish PBP unsupported. Lots of famous names there. I hear that Mick Latimer is recovering from illness down in Tasmania. Ian Boone must have been very young then. Mick did his fastest time of 52:42 in 1991 and was first rider back with a saddlebag that year, so probably had no support. He was riding with Suzie Gray in 1995, trying to help her get under 60 hours and be fastest British lady. At one control their support vehicle was parked slightly outside the permitted zone and an official was going to give them both a time penalty, but Mick persuaded them to just let him take the rap and he was given a two hour penalty. That's why Suzie's time was 59:14 and Mick's was 61:14 even though they rode together. Thanks for that. I was just beginning to think it must have been 95. John Barkman's from the USA, although an AUK member. So Gethin Butler is the fastest Brit. Damon, I am a British citizen - 22 years in London, and a member of AUK for 20 years. I proudly count myself part of AC Hackney now! You've kept your accent well, but so has Gethin, for all his years in Preston. Apologies for my assumptions. People do move about, Charly Miller was born in Germany. Mick Potts was one example of a 24 Hour TT winner who put in a fast time. George Berwick was another in 1979 at 62 hours 36 min. That seems a realistic aim for a UK equivalent of La Société Charly Miller. La Société George Berwick has a certain resonance to it. Maybe, though 1979 was only 40 years ago. Of course, folk can still compete against George at the Mersey Roads 24hr TT each year. Do you think he'll ease off when he reaches 60 x 24hr TTs? Measuring your PBP time against Oppy's would be a big ask. I think only two Aussies have ever managed to be quicker than Oppy, despite some very strong riders attempting the challenge. George Berwick is also still a record holder for London to Edinburgh, on a tandem in 1988. There's been a bit of crossover with place to place records and PBP over the years. Gethin Butler held the Lands End John O' Groats record in 2003, when he rode PBP. Oppy was the current PBP winner when he gained the LEJOG record in 1934. I was musing about those connections when I made this film about the LEJOG record in June of last year, which features the voice of Hubert Opperman, an appearance by Gethin Butler at Shap summit, footage from various Mersey 24s and from PBP 2015. Thank you for sharing, Damon. At 17.00 we see the Great Stacks of Duncansby. We can see the cliffs leading to Dunnet Head at 16.52 from just by the lighthouse at Duncansby, with Jo'G in the mid-distance, if you're watching in 1080 you can see the hotel. Dunnet Head is the most Northerly point, Duncansby Head the most North-Easterly. Not going to one of them if you're in the area is a bit of a crime in my book. I hit Duncansby at about the best time possible, at the best time of the year, which is why I squeezed it in. Likewise the aerial shot of the ferry, with the dawn over Orkney. Not remotely right, unless you are talking about only fast men. British riders in 1971 http://www.aukweb.net/results/pbplel/pbp1971/ and I know for a fact that George Davis (Portsmouth) rode to Paris, rode PBP and then rode home again. No support. In 1975 there were even more that did just that. Harry Aspden was one of the UK riders in 1975. He was a journalist, and there's some of his work on the BC site, which has a lot on the history of Audax and PBP. There's a specific PBP Hub. I'm quite interested in the pre-history of long road rides. Similar distances were being posted in Six Day events, which took place in marquees with temporary tracks. They tended to be limited to between 10 and 14 hours a day. Charles Terront was making his living from such spectacles from 1879, and Charly Miller is listed as winning one in 1899.